"I've tried DHC, Shu Uemura and Hada Labo cleansing oils and this is my favorite. I feel I need the least rubbing into my skin with this one, and it takes the most stubborn mascara off easily. The texture is also very nice and comfortable on my skin. Ideal for make up removal, cleansing, toning even as a reusable alternative to cotton wool for babies and nail polish removal. Washable at 30C. 10cm 100% Cotton rounds x 4. For all skin types. Effectively removes even waterproof eye make-up. Caring formula protects eye lashes - suitable even for the sensitive eye area. Compatibility dermatologically and opthalmologically approved. Quickly, gently and effectively removes make-up, dirt, excess sebum and other impurities from the eye area. skin feeling soothed and refreshed. 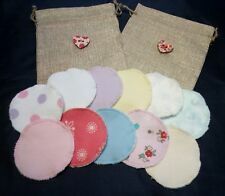 Reusable Makeup Remover Pads With Soft Plush Bamboo Terry Towelling Backing. The pads are made of a two layers consisting of a top layer of soft brushed cotton and a bottom layer of soft plush bamboo terry towelling. Wash the pads before using. These maintain their shape after washing, I use the bamboo terry towelling for my daughters feeding tube pads, it is lovely and soft next to the skin and washes really well. Gib etwas Reinigungsprodukt auf das Pad und wische zur Reinigung sanft über dein Gesicht. EARTHTOPIA waschbare Abschminkpads aus Bio-Baumwolle | 10 Stück inkl. Pflegehinweise: Die Abschminkpads können bei bis zu 60 Grad im Wäschesäckchen in der Maschine gewaschen werden. Experience the ultimate cleanse withDHC's Deep Cleansing Oil, a revolutionary oil makeup remover infused with antioxidant-rich Olive Oil. NEICHA protein remover pads will remove all make-up and proteins from eye zone before the application procedure. Contains 9 different extracts to nourish your eyelashes. EYELASH EXTENSIONS. 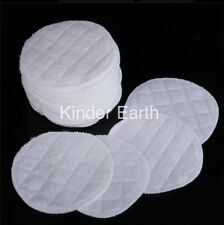 75 EYE MAKEUP REMOVER PADS. Makeup Remover Cloth is so quick and easy to use and works with only water. WE ONLY CAN FIX A PROBLEM IF YOU LET US KNOW. It was part of a 2018 gift set. 1 Estee Lauder Gentle Eye Makeup Remover 3.4 FL. I appreciate your patience and understanding. TRAVEL SIZE, 2 x 15 ml giving a Total of 30ml. Expiry 2021. No Box, originally from a larger set which I have split. Wipes are disposable and thoroughly cleanse skin without irritation and leave behind no heavy residue, so there’s no need to rinse. Facial cleansing wipes feature an alcohol-free formula to cleanse while also being gentle on the face, and are ophthalmologist-, dermatologist-, and allergy-tested. W7 Mini Magic! Makeup Remover Cloth. The Mini Magic makeup remover cloth by W7 that's so quick and easy to use and works with only water! YVES ROCHER. Olio Micellare Detergente. Arricchito con Camomilla dalle proprietà addolcenti e protettrici. Questo olio setoso e non grasso elimina il trucco, anche quello a lunga tenuta. 91& di ingredienti di origine naturale / 0% coloranti, oli minerali, parabeni. Condition is New. Our Gentle Eye Make-up Removal Pads, enriched with essential, skin loving minerals and vitamins, gently cleanse eyes of make-up, even waterproof mascara whilst caring for all skin types with: Skin loving Pro-Vitamin B5 known to condition eyelashes. Obagi C RX C-Cleansing Gel 6oz. Wash your way to an evenly toned complexion with Obagi-C Rx System C-Cleansing Gel. Soothing aloe vera ensures a refreshing clean sensation that never leaves skin feeling dry or tight. Contains Olive oil softens the skin and prevents dehydration, rejuvenates, prevents and smooths wrinkles, and contains large amount of vitamin E that protects skin and prevents dullness. Magnitone Wipeout MicroFibre Cleansing Cloth. Condition is New. Dispatched with Royal Mail 2nd Class. The prices have gone up. New sealed set of 2 full size 2 oz each. Neues AngebotNeogen Real Flower Cleansing Water Calendula 9.9 oz. Boost your face care routine with the power of botanicals. Extracts of calendula, chamomile and cucumber act as natural cleansing agents to clear away makeup and impurities, leaving your skin feeling fresh and renewed. Neues AngebotNeogen Real Flower Cleansing Water Rose 9.9 oz. Purify your skin with Neogen Real Flower Cleansing Water Rose. Real rose petals and extracts of aloe, cucumber, hibiscus and rosemary flower combine with other natural cleansing agents to purify pores without irritation or dryness, leaving skin feeling soft and supple. With this cleansing oil, you'll never have to scrub your face again! Its clear oil will remove the blackheads. Winner of 2014 Best New Cleansing. 2014 Best Cleansing. YVES ROCHER. Struccante Rapido Occhi. Lo Struccante Rapido Occhi è adatto alle tue esigenze! Elimina il trucco waterpoof! Hai bisogno di eliminare il trucco più resistente?. Estée Lauder. and plump up even the sparsest lashes so they're big and lush and full of flirtatious curl. A weightless, volumizing mascara that lifts your lashes all the way to big, bold and beautiful. UNOPENED AND UNUSED "MAGNITONE" WIPE OUT CLOTH. A revolutionary, three-in-one cleanser, purifying makeup remover, and antiaging serum for better looking skin. Bye Bye Makeup™ is your revolutionary fast-acting cleanser, makeup remover and anti-aging serum all in one step. Size - 25ml - travel / sample size. Sephora - Waterproof Eye Makeup Remover. Gel Polish. Fungus Fix. Led & UV Gels. Machine & Furniture. Magnitone "WipeOut" MicroFibre Makeup Cloths. By Global facial cleanser expert "Magnitone". Effortlessly remove makeup with the Magnitone London WipeOut! Before using Magnitone WipeOut! Cleansing Cloth, pop it into the washing machine at 30°C Wet your cloth with WARM WATER Using a gentle circular motion, wipe away your makeup, including over your eyes. QUICK AND EASY : Redo your mistakes easily and precisely with this makeup remover pen. Don't cover up again with concealer - you would end up with thick, caked on make up. Glass-like clear tip applies quickly for a gentle correct. CLEANSING BALM. made with love by. The box includes 20x 0.09 oz/2.56 g Pads. The expiration date is 10-30-2019. The item is 100% authentic. The item details can be found below. - Dullness and uneven texture. -Lightly press wipe over eyes to allow makeup to dissolve before wiping away gently. 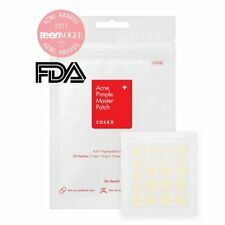 2 x 60 pads - 55 mm Nip Fab Kale Dry Skin Fix make-up.